Sony takes the crown once again, over the past four years Sony has claimed the crown for three of them! Well I had the opportunity to pick the brain of a Sony rep at a local photography store and finally hold the A7r for two hours. With out sounding like an absurd fan I have to say I was so impressed with the build quality and light weight compact form it is truly living up to the expectations that have come to be since I started following the rumors back in July. Overly impressed with the eye focus feature that was so quick and concise. The camera was a test model rocking the .90 firmware so it wasn't up to par with lens recognition so when the rep put on the 10-18mm E-Mount the pincushion effect was almost tasteful and appreciated. Of course mounting APSC lenses on the full frame led to vignette edges but you can look past it and still admire the camera in its full beauty. Had the chance to also test the upcoming Zeiss lenses and the clarity was as you would expect with Zeiss. "Hey I know you really want this Isaac! I watched you log on at 3 am and place your preorder why not enjoy it a week early and have it in your hands to photograph the moments that occur at Thanksgiving?" Immediately I told them my situation and that I would cancel my order with Amazon. The frugal part of me realized I would then be paying tax on the purchase but in the end it appears more than worth it as I can enjoy the camera at Thanksgiving and contribute to a locally owned and operated store which has suddenly started carrying more Sony gear and that in the long run is more than worth it. The staff was so friendly I wasn't sure if it was because they wanted to test my A7 and kit lens or just that they were pleased that I wasn't a customer asking the same questions they are bombarded with daily. 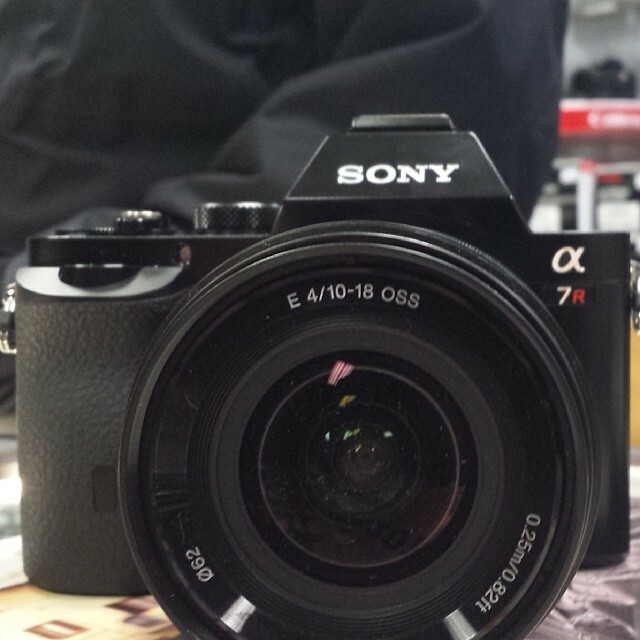 Either way the end result was the A7r and A7k they were told would arrive actually didn't arrive. An employee called me in the evening and stated he chewed out Fedex and was told the package was in Grimes and would be delivered tomorrow and he plans on calling me upon arrival. So there you have it, I will have my camera early, while assisting a locally owned business rather than Amazon where I am just a number and run the risk of not receiving the camera in time despite the likeliness that they received plenty of the cameras and I am for certain I was in the front of the queue for orders. So tomorrow evening I will walk out with charged batteries and completely explore the camera adjust to the new button locations and difference compared to my VG20 and enjoy the new lens. I did not walk out of the store empty handed, as the Sony rep gave me a complimentary Sony travel mug which was much appreciated as I haven't had one in at least a year and what better way to enjoy coffee than reading the Sony logo on my coffee cup. Well it is time to edit some pie video and get some rest before tomorrow's adventures! Continuing to apply for jobs and within weeks I should have something to help pay for the accessories on my wishlist! Stay warm and bundle up!